An elderly woman miraculously escaped tragic death on Saturday, November 1, after she was attacked by a man on her way to farm in Sapele area of Delta state. The widow was on her bicycle when she was reportedly attacked by the man who used a plank to hit her down before using a cutlass to strike her. According to a journalist, Sapele Oghenek, after striking the woman down, the attacker made an attempt to cut off her head before she raised an alarm and screamed loudly. Her scream made the attacker to flee and abandon his mission, after she sustained a deep cut on her face following the first machete strike. 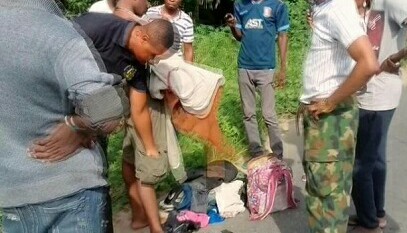 It was gathered that the case was reported to the police and vigilante operatives who allegedly asked the old woman to bring N15,000 so that they can arrest the suspect. As at yesterday, the woman’s bicycle was still at the scene of the crime.